One hundred years ago on this very day, the armistice ending the “war to end all wars” was signed just outside the city of Compiègne, France. World War I, as it is now known, was a bloodbath, an unleashing of horrors heretofore unknown by humankind. From machine guns (“the devil’s paintbrush”) to phosgene gas, technology had overtaken military tactics, resulting in a massive scale of death. 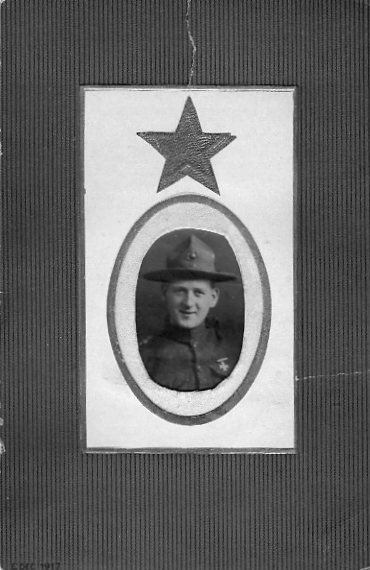 One of those was my great uncle, Frederick “Ted” Fox, a Marine. 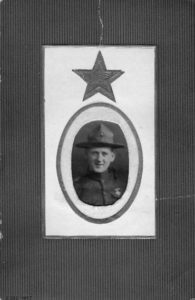 He died in the Battle of Belleau Wood and is buried in Arlington National Cemetery. The longest book I ever wrote was the historical, Glimpses of Paradise. It begins in 1916 Nebraska and ends in early 1920s Hollywood. In between is a World War I sequence that was the result of intense research. Extensive reading. I found some books deep inside the downtown branch of the Los Angeles Public Library that were priceless first-hand accounts of World War I battles. I also spent hours in the microfiche room, going through newspaper accounts of the same. I connected my emotions. I believe that if we’ve made it past forty or so in this life, we’ve experienced every emotion there is to a greater or lesser degree. While I have never felt the fear that a soldier feels on the eve of battle, I have felt the fear of dying. The same physiological response is there, and by extrapolation I brought it to the characters in the book. I looked at a lot of pictures of battlefields, soldiers, weapons and so on. I wanted to be soaked in them, so I could write with that soaked feeling. I had an expert review it. I showed the battle pages to someone who knows warfare, and got some notes for changes. How about you? Have you ever written way outside your experience? What did you do to get it right? Please tell us in the comments! And please pause a moment this Armistice Day to honor those men who gave the last full measure of devotion for our country a century ago. Also, my film professor son alerted me to a new documentary by Peter Jackson about soldiers in World War I. The talented Jackson took old, herky-jerky silent film footage, digitized it and used computerization to connect the frames and make all the movements natural. Then he colorized the footage. This entry was posted in research by James Scott Bell. Bookmark the permalink. Since I don’t want to write stories about Administrative Assistants doing boring work, every book I write is outside my experience except for, as you noted, bringing relatable emotions to the fictional situation at hand. Also as you noted, it’s the research, the really digging in and immersing yourself into place and time (even if it’s a modern story) that makes it possible. I love, love, love doing research. It’s a win/win situation. Not only do you get the information you need to make your story real, but I’ve never done research that didn’t yield a ton of other ideas. It’s like opening a can of coffee (do they still make coffee in cans?) The aroma of ideas comes pouring out of research. Maybe if you open a coffee pod you can find one or two ideas. I’ve found people are generally willing to help you, so I try to talk to the people who HAVE done the things I’m making my characters do. But as JSB so wisely points out, it’s about the emotions. We might feel them for different reasons than our characters, but we can still channel them. I just hope nobody pokes around in my search history and saved bookmarks. You’re right, Terry. People usually love to talk about their work. As a writer, you need to establish trust with the person, esp. when it’s law enforcement. For the latter, a personal recommendation really helps. LOL – I requested a “slow” shift when I did my ride alongs because I wanted to pick the officer’s brain. It was a trade off, but I had more time to ask questions that way. I HAVE to weigh in on the question about writing outside my experience. Yes, I have. Yes, I do. And I’m always lost when doing so. My current series (one novel of which has been accepted, and I’m growing old[er] waiting for the publisher to schedule it for publication) takes a 4’11” Southern Baptist girl-next-door cheerleader and third clarinetist when she was in junior high, turns her into a U.S. Marine military police officer (I get a prolonged huuuuuuu? as I do that) and plops her into the middle of paranormal stories. How does such a small girl become an MP? Bigfoots, dogmen, disappearing Americans all over the place, skinwalkers, UFOs: they’re all there. Never having been a Marine, though I have a son who is (there’s no such thing as an inactive Marine), I have to pick his brains a lot. What’s it like to go through the defining experience for a Marine-in-training, the Crucible? What happens when you are fighting, and there is some knucklehead who keeps plinking very close go your position? So I have a source of information about those things, though from a male Marine point-of-view. What happens when a petite American girl in training at Marine Corps Recruit Depot, Parris Island, is in water training–learning how to swim even if you can’t–when a large girl splashing next to you suddenly begins to panic and starts going down, weighted with many pounds of equipment including a rifle? Not so easy to research. Not so easy to come up with the emotions about dealing with that. What happens if an All American girl has an adopted niece who was raised for the first 15 years of her life in an orphanage in Chengdu? What do the speech patterns of such a young woman sound like as she is learning to speak English? That was a tough one to find out about. But then, comes the toughies? How do you find a bigfoot who may have kidnapped your close friend’s son? How do you get the boy back? How do you even fight a bigfoot? What do you do when you have to rescue a small girl from a dogman who has just killed your newest best friend and wants to kill both you and the girl? What does a dogman even look like? What does it smell like? I’m not concerned with questions of ontology, about whether these things exist. I want to know what it would be like if one of these gets close enough so that my character can smell its breath. Does a dogman lick its chops before he prepares to dine? What does it feel like if you raise your sidearm to shoot it and it knocks it out of your hand and you hear it bouncing down the side of the cliff face you’re trying to scale with a four-year-old tied to your back with jerry-rigged, slippery plastic ropes? My answer to these questions? I have no idea. So yes, I do write, all the time, about things that I have no idea what they’re really about, how to solve them, how to know when to end them, how to even know when they’re ended. How to be the hero even when so very terrified. So, I get paid this week. (I’m on a retired income.) I will buy a copy of Glimpses of Paradise. I believe that the story will give me more insight about how to write about things I have no idea about. I have to learn somehow. In one way, Jim, I think writing about paranormal experiences frees you to have fun way outside the box. Or you can watch those commercials about Bigfoot. He likes beef jerky! I think _Glimpses of Paradise_ was the first book by Jim that I read. A good book. Since I’m not into thrillers, I probably like it better than some of his more recent novels. Writing paranormal or Sci-fi, the basic story telling fundamentals can be the same. Hopefully none of us will know what it takes to face a killer, yet we write about it. When I wrote my debut book NO ONE HEARD HER SCREAM, I had a hard time thinking like a homicide detective. How would a cop “think”? How would I conduct my own investigation to proactively hunt a killer by deducing clues/evidence? When my plot came to a halt because I didn’t know what a cop would do, I stopped writing for a day or two. I cleared my mind & allowed my brain to lead me without forcing it. When I found myself watching a Christian Slater movie, GLEANING THE CUBE (a skateboarding kid who becomes a witness to a crime), the plot of it struck me. Instead of having my woman detective be the aggressor as an investigator, I made my bad guy(s) hunt HER, diabolically. I didn’t have to run a cop case. I just had to keep her in an escalating danger (like the kid on the skateboard). After the lightbulb went off in my head, I plotted the end of my book & finished it (6000 words/day). I use technical advisers on heavy research projects, along with internet searches & research topic books. For locations I haven’t been, I research a lot & use Google maps to “walk the streets.” I also draw,on personal travel experiences to imagine what my senses would experience. Going to a locale is best but nothing stops me from writing about something I don’t know about. For paranormal stories, use your senses to imagine what a “power” might feel like, coursing through your body. You have to have a view & write it convincingly. If you have a creature, invent it completely. Draw on other known animals & create a world that feels real. Great added tips, Jordan. Thanks. Like you, Jim, I based my Sumerian historical series on an extensive accumulation of books purchased and borrowed. The stories take place in Iraq, but 5,000 years ago. Not only was I not even a gleam in my daddy’s eye, neither were the archeologists and anthropologists who published findings from found relics 100-200 years ago. The more I read, the more fascinated I became with a people who began civilized society, ran it for 2,000 years, and disappeared, all before biblical accounts were begun. It would seem the Sumerian kings engaged almost constant warfare between city states for 2,000 years. Those brutal clashes are often the only records left for us to read. But what happened between? How did ordinary working people cope? What personal and collective triumphs and achievements went unrecorded? We think we know what Sumerians looked like. Our best scholars can surmise what their spoken language sounded like. But what I discovered in all that study was that they were human beings with human desires, emotions, flaws, ambitions. The fun I had in writing a fictionalized version of empowered Sumerian woman’s life came from using my imagination to condense that immense epoch of human progress into a single lifetime where all those human factors come into play. I published my reading list of 36 documents on my website. There were more. I was lucky to find new books on the topic when I did my research 20 years ago, for the science of Sumerology has continued despite the interruptions of war in that region since. Fascinating, Dan. And sounds like you really loved the research. That may be a “sign” to look for when getting ready to write about another time and place. Are you loving the research? Thanks, Jim, very nice gesture. But we knew you were a gentleman in spite of all the tweets. LOL…obviously you have me mixed up with … ! Just for fun, a couple of years ago, I wrote a Western (short story). I suspect everyone knows enough (from movies and history) to write a Western that skirts their areas of ignorance. But then I added a sequel. And another. And suddenly I was in over my head. Before I can do the novel these are leading to, I’ll need to do a lot of real research, ca 1875 to ’90 or even Civil War to ’90. West Texas was changing so rapidly (for example, just trying to see where rail service was available require attention to year and perhaps to month). Most demanding might be learning about relations between ex-Confederate and ex-Union living together in West Texas, and maybe also about the social status and experience of the Buffalo Soldiers in those years. That research sounds like an enjoyable time though. 19th century American West is my favorite. Yeah, I’ve considered a Western, but am daunted by the research. Those who read Westerns want absolute authenticity. And they know their stuff. I don’t know much about writing outside of my experience, but I remember reading that Stephen Crane wrote “The Red Badge of Courage,” a novel praised for its realistic treatment of battle, even though he had never served in war. I wonder what his secret was. I watched the trailer for “They Shall Not Grow Old.” It was amazing. I’m looking forward to the documentary. Now that you mention it, Kay, I recall that about Stephen Crane. It would be a good study to find out what he did. Remember that authentic English accent Kevin Costner used in his Robin Hood movie? Me either. Almost as good as Brad Pitt & his Irish accent. Your question touches on my dilemma: I only write about the Foreign Service and life overseas in a diplomatic community because that is all I know. However, when I write about the foreign nationals that I worked with or knew well—when I make them heroes or secondary characters—editors will say: you shouldn’t really write about Turkish women or African men. You’ve never been either one. This frustrates me. I’ve never been a husband, and you’ve never been a wife, but I’ll bet you have wives in your stories, just as I have husbands. One must recognize that the currents of present day thought, much of which is laced with a toxin that tends to choke artistic freedom, are seeping through the ceilings and carpets of editorial offices within the Forbidden City. I suggest self-publishing. I enjoy the mornings or afternoons that I step away from writing to do research. So, far I have read two books on World War Two submarines, one book on tugboats, several you tube videos on Cape Fear River tours, and the outer banks of the Carolina’s. And that’s just the past two years. Plus a vacation to Charleston to get the feel of the area. I enjoyed watching the trailer video. Glad you enjoyed the trailer. It’s pretty awesome.